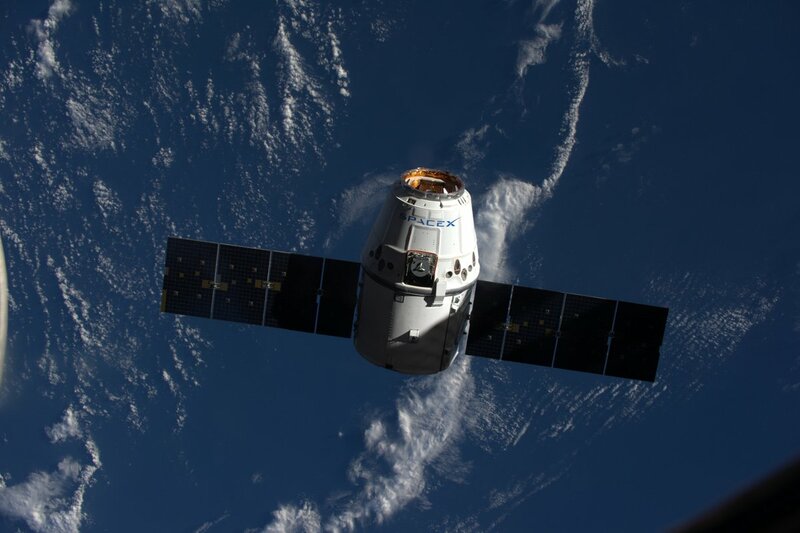 A commercial resupply freighter owned and operated by SpaceX wrapped up a two-day trip to the International Space Station on Wednesday, delivering a new docking port and two tons of other equipment to research laboratory more than 250 miles (400 kilometers) above Earth. The equipment will support more than 250 science investigations in the coming months, and help ready the space station to receive new U.S.-built space capsules carrying astronauts as soon as next year. The Dragon spacecraft, measuring 12 feet (3.7 meters) in diameter and nearly 24 feet (7.2 meters) long, approached the space station from below, its outline growing in size backdropped by the blue hues of Earth. With laser ranging sensors and thermal cameras feeding rendezvous data to Dragon’s flight computer, the cargo capsule slowly climbed toward the station from directly underneath, pausing at pre-selected locations before reaching a final capture point about 30 feet, or 10 meters, from the complex. Ground controllers at SpaceX headquarters in Hawthorne, California, monitored the Dragon’s approach, while engineers at NASA’s control center in Houston were in charge of the space station. 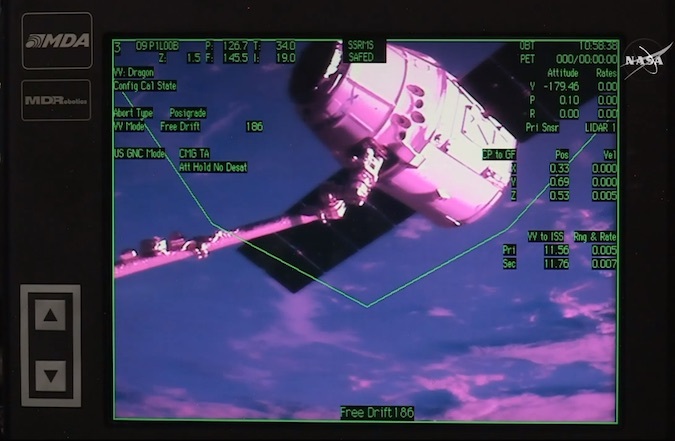 Astronaut Jeff Williams, at the controls of the station’s Canadian-built robotic arm, grappled the Dragon spacecraft at 6:56 a.m. EDT (1056 GMT) as the outpost sailed more than 250 miles over the Great Lakes. Ground controllers took over the robotic arm to maneuver the solar-powered Dragon spaceship to the Earth-facing port on the station’s Harmony module. 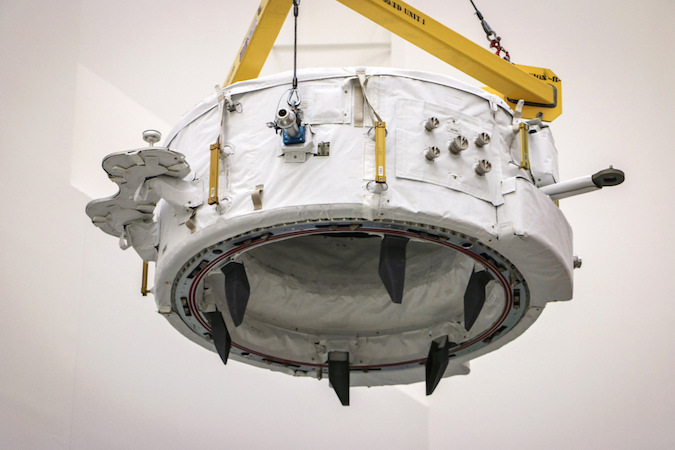 Once in place, 16 bolts engaged to firmly attach the cargo delivery craft to the complex, where it will stay until Aug. 29, when it leaves and returns to a parachute-assisted splashdown in the Pacific Ocean. The rendezvous came two days after the Dragon spacecraft blasted off early Monday from Cape Canaveral atop a Falcon 9 rocket on SpaceX’s ninth operational resupply run to the space station. The company is under contract for at least 17 more cargo flights through 2024. The mission’s cargo manifest includes 4,976 pounds — nearly 2.3 metric tons — of supplies and experiments, including a new docking system to connect with the CST-100 Starliner and Crew Dragon piloted spacecraft made by Boeing and SpaceX under commercial partnerships with NASA. 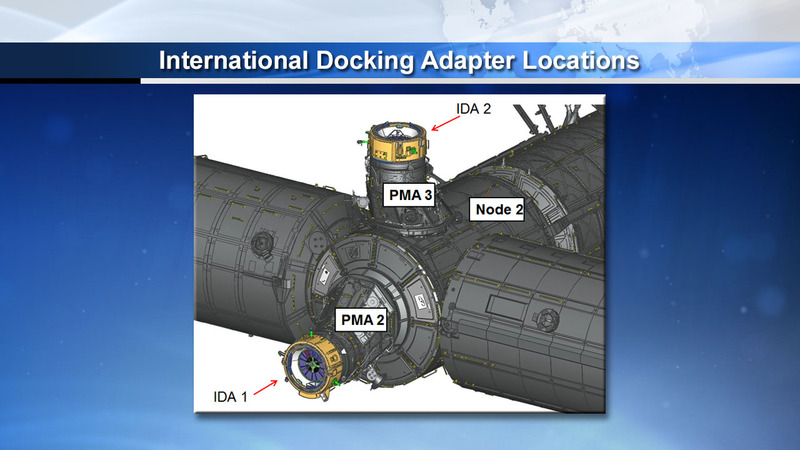 The International Docking Adapter-2, or IDA-2, is bolted inside the Dragon’s unpressurized cargo carrier, or trunk. 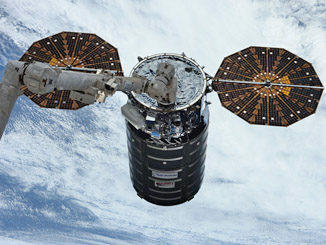 The space station’s robotic arm will pluck the docking adapter from the Dragon’s trunk Aug. 16, and Williams and crewmate Kate Rubins will go outside on a spacewalk Aug. 18 to help install the new docking port on the front end of the Harmony module, where the CST-100 Starliner and Crew Dragon crew capsules will park with arriving astronauts. A similar docking adapter was lost in June 2015 when a Falcon 9 rocket disintegrated over the Atlantic Ocean two minutes after launch, destroying a Dragon cargo freighter and its contents. IDA-2 weighed about 1,029 pounds (467 kilograms) at launch, measuring about 42 inches (1.1 meters) tall and 63 inches (1.6 meters) wide. “The docking adapter is another step forward to enabling the commercial crew vehicles,” said Joel Montalbano, NASA’s deputy program manager for space station utilization. The docking port is one of the largest external components to be added to the space station since large-scale assembly of the outpost ended with the retirement of the space shuttle in 2011. Spacewalkers will install the docking adapters over the station’s existing U.S. arrival ports designed for space shuttle dockings. The new docking ports use a different design to receive any spacecraft, including the SpaceX Crew Dragon and Boeing CST-100 Starliner spacecraft, future cargo freighters, and other craft yet to be developed. Kirk Shireman, NASA’s International Space Station program manager, said before Monday’s launch that the docking adapters are built to an international, open-source standard. 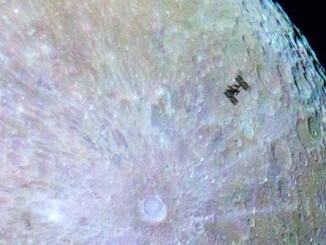 The design could be used if NASA deploys mini-space station near the moon in the 2020s, a project that could be a stepping stone to fine-tune techniques and technologies for a future human expedition to Mars. “It’s quite possible, although we don’t have a definitive plan, that we’ll fly something very similar to this idea to cis-lunar space in the future,” Shireman said. NASA signed a $9 million contract with Boeing to build a third docking port to replace the unit lost last year. It is set for launch on a SpaceX Dragon capsule in 2018. The space agency wants two docking adapters on the space station to support the presence of two U.S. crew vehicles at the same time. The space station needs two docking ports outfitted for the CST-100 Starliner and Crew Dragon capsules for two of the capsules to reside at the complex simultaneously. That would allow for a new space station expedition crew to arrive before the old crew departs. With one docking port, the outgoing crew must return to Earth before a fresh crew arrives. SpaceX and Sierra Nevada Corp. plan to offer NASA the option of docking capability on future resupply missions with the Dragon and Dream Chaser cargo spacecraft. Orbital ATK, NASA’s other cargo transportation provider, is sticking with the berthing scheme currently in use, which allows bigger equipment to be transferred inside the space station through a larger hatch. Russian Progress cargo freighters dock to the space station at different points on the Russian section of the complex. In the weeks leading up to next month’s installation of the new docking adapter, the space station’s Expedition 48 crew will unpack 3,946 pounds (1,790 kilograms) of cargo inside Dragon’s pressurized cabin. The mission’s cargo manifest provided by NASA lists 2,050 pounds (930 kilograms) of science experiments, 815 pounds (370 kilograms) of crew provisions like food and clothing, 617 pounds (280 kilograms) of vehicle hardware, and 280 pounds (127 kilograms) of spacewalking gear, including a spacesuit. 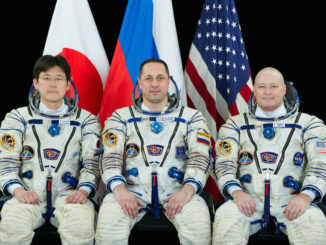 Other items include computer resources and supplies for the Russian segment of the space station. Dragon delivered specimens inside refrigerators and freezers, plus experiments aimed at human research, physical sciences, Earth and space sciences, technology demonstrations, and education, scientists said. One experiment delivered to the space station by the Dragon supply ship will demonstrate DNA sequencing in orbit for the first time. With the help of space station flight engineer Kate Rubins, an infectious disease expert, scientists hope to sequence the first genome in microgravity, a breakthrough that could lead to improved identification of dangerous microbes inside spacecraft, the diagnosis of diseases, monitoring of astronaut health, and the detection of DNA-based life elsewhere in the solar system. “The samples that will be sequenced for the first time will be a mix of genomic DNA from a bacteria, a virus and a mouse,” said Sarah Wallace, a microbiologist at NASA’s Johnson Space Center in Houston. “Each sample is identical, and we’ll look at three different experiemnts to look at how the data compares on the ground when we do it versus on the ISS. “It’s going to be a game-changer to have this capability on the ISS, and we’re really excited for all the research potential that could come,” Wallace said. 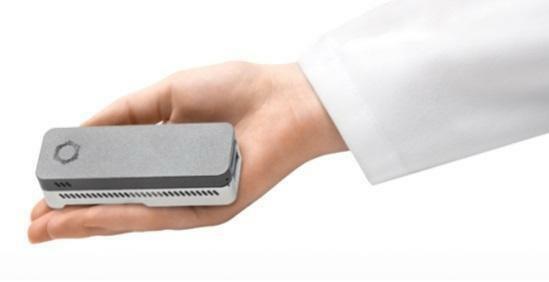 The sequencing device to be tested in the coming weeks could also be used for research into RNA and protein, Wallace said. Other investigations aided by SpaceX’s resupply run include a study into the heart’s response to microgravity, an experiment in how to better protect computers from radiation in space, a test of a new spacecraft cooling system, and a demonstration of how to improve tracking of maritime traffic from space.